Remember the time when it was standard for a file manager to have a dual pane interface? If you do not, you might find Commander One looks a bit odd. But if you ever used a dual pane file manager and got a feel of advantages it offers, you most probably find it difficult to do without it. Finder, the default file manager for OS X, is quite convenient when it comes to quick navigation. However it has a number of significant drawbacks. One of them is a single pane interface – a lot of file management operations involve working with two catalogues, so things are much easier if you see both folders at once. The speed at which you can manage a large number of files with the help of Finder leaves much to be desired. Finder’s archive functionality is limited too. The only archive format supported is ZIP, you can’t adjust a compression ratio, edit archives by adding or removing files. All in all Finder is a good option for those who do not need to manage files on a daily basis. If you do, you would be better off if you find apps that offer features missing in Finder or an alternative file management solution. Over many years there was no decent dual pane file manager for Mac OS X. Windows users had better luck – their most popular file manager Total Commander offers a lot of customizable options and handy features that enable managing files of various formats, including previewer, universal archive utility, FTP client, etc. 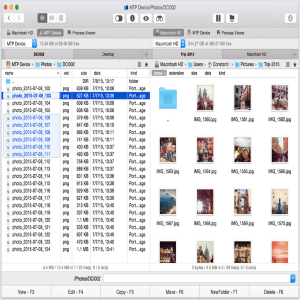 Commander One, a new file manager for Mac by Eltima Software, is meant to replace Finder by offering functionality the latter is lacking. Its powerful features enable managing files in an easy and efficient way, read below for their detailed description. 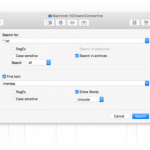 Moreover it also works as a replacement for Total Commander for those who switched from Mac to Windows. Christian Ghisler, the creator of Total Commander, on his web-site recommends Commander One as an analogue to his program for Mac users. So what does Commander One have to offer you? First of all, it is a dual pane interface that allows opening an unlimited number of tabs and supports previewing files of any format, including binary and hex. The program also offers an excellent search tool. 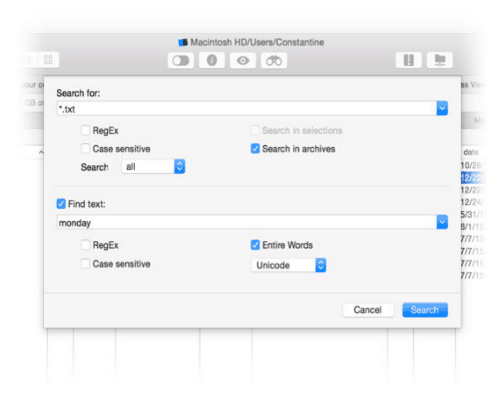 You can look for a file using regular expressions; this includes searching contents of files and archived folders. The app has integrated Spotlight search and it searches all disks – local, as well as remote. Just like Finder, Commander One supports ZIP format but it offers you more options such as archiving, extracting files, opening and editing ZIP archives by adding and removing files to them as if they were regular folders. Viewing hidden files by pressing one button, etc. Commander One has a paid version – PRO Pack. For a reasonable fee of 29.95$ it offers a set of handy features that will replace functionality of some other programs. Thus you won’t need paid archive utilities anymore. Apart from ZIP, Commander One PRO Pack supports RAR, TBZ, TGZ, 7z. You get a total control over your files – compress and extract files, preview them without extracting, work with an archived folder as it were a regular one. The only limitation as of now is compressing files in RAR format, developers promise to get it fixed in the near future. The app is also a powerful FTP client for a quick and safe files transfer between FTP, SFTP or FTPS. You can download/ upload files in several threads, and perform any operations with files on remote servers as if they were located on your computer: copy, create, delete, edit, etc. Commander One provides a quick and easy access to files on iOS (access to User/ Media folder) and MTP devices. Connect your iPhone, iPad, photo-, video camera, and Android devices (in MTP mode) with the help of a USB cable and get full access to the contents of these devices. The app comes with a terminal emulator, can display a list of processes with the option to quit any of them, and you can choose a preset UI theme (changing Theme settings is free). The full list of Commander One functionality is available on the developer’s web-site. Commander One PRO Pack functionality is available to you for 15 days trial for absolutely free.